Spiral Dynamics is a developmental model of individual, organizational, and cultural values change based on work by psychologist Clare Graves in the 1970s. It is just well-enough validated to consider here, as a good example of its class. Like the field of foresight itself, this model needs more evidence and modification (running its own Do loop) to be taken seriously by cultural psychologists, who like to poke fun at its lack of rigor. Ken Wilber’s Integral Theory, well illustrated in A Theory of Everything (2001) is another promising model needing further development and rigor. Both have many similarities to other simpler models of values, psychology, and identity development that are better validated. 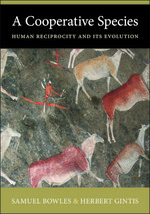 Rokeach’s Understanding Human Values, 2008 introduces those, and the emerging science of values development in individuals, organizations, and cultures. 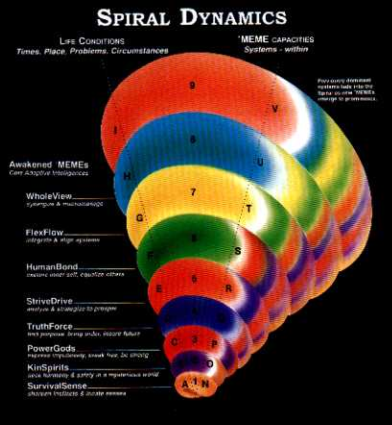 Like all developmental models, spiral dynamics has some cyclic features as well, of at least two kinds. First, the model recognizes that at each values or preferences stage the individual, organization, or culture engages in a good deal of repetitive exploration of its typical thoughts and behaviors before the next stage emerges. Think of organizational and cultural fads, styles, and tastes, which fall out of fashion if they become too common, repetitive and predictable, in favor for something new, which is often just something old that again becomes new. Second, the model stresses that the individual, organization or culture is developing on a life cycle. Just as in life cycle models of psychological development, there can be regression to earlier stages, as occasionally happens after trauma in growing system, and there can be senescence and sclerosis of thoughts and behaviors, in which case rejuvenation must occur or the system may die. In any over-mature (rigid, overly controlled) developmental system even small traumas may trigger regressive and maladaptive behaviors. The declining system must renew itself to regain its previous developmental level or to move beyond it. Books on resiliency, unlearning, presencing, and becoming more childlike are all helpful here. Children, living with little past, are quite good at being in the present, being open, loving, and fearless learning. These are traits we need more of as we mature. Understanding values development, and how to promote renewal in mature organizations and individuals, can be one of the foresight professional’s most significant contributions. Don Beck and Chris Cowan first published their developmental values model in Spiral Dynamics (1996), and it has slowly gained in popularity since, with several psychology, therapy, integral theory and organizational development consulting groups now using and offering training in it. It is a model of converging values development over time, as individuals and groups learn to build increasingly complex mental models to handle new problems. The model is usually represented as an expanding cone of increasing radius at higher levels, representing the increased complexity of activity at those levels. Unfortunately, such a representation is a bit misrepresentative, and in conflict with developmental theory. A more accurate but more controversial representation of values development would be as a contracting funnel of decreasing radius at higher levels. This is because each new level is more self-regulated, morally constrained, and predictable in regard to expressed values and behaviors than the more chaotic, blindly experimental, and impulsive lower levels. Social scientists who propose that social moral development has predictable directionality to it, such as the Spiral Dynamics thesis, are in the minority today. Those who do historical and comparative social research on cooperativity and reciprocity are among that minority. I recommend Bowles and Gintis, A Cooperative Species, 2013, for one excellent account. It also seems uncommon in social science today for scholars to propose that more values-developed social systems become, the more regulated, constrained, controlled, and predictable they become in their average behaviors, relative to less-developed systems. They gain increasing total freedoms, but decreasing occupation of failure states and nonadaptive behaviors, the more complex they become. That is how biological development works, as any student of organismal development learns, so we should expect the same in social development. We maintain therefore that future evidence will show, all else being equal, that individuals, organizations, and cultures at the higher stages of values development are significantly more predictable and self-controlled. They are freer in particular to make new kinds of useful mistakes, but less free to make old mistakes, the more experience they have, which makes them more predictable in lots of specific new ways. The Spiral Dynamics model proposes eight stages of values and world-view development: Survival, Clans, Power, Purpose, Autonomy, Empathy, Systemic, and Holistic, and describes healthy and unhealthy adaptive states at each values level. Some advocates take pains to state that spiral dynamics is not progressive, with higher stages not being “better” levels to attain. I consider that position to be politically correct doublespeak, something occasionally said to avoid socially uncomfortable truths. Those apparent truths are that higher-level values and world-views in this or any developmental model offer a better ability to adapt in more complex environments, as well as to relate better to all those presently adapted to lower-level value systems. Higher levels of values are also predictable developmental destinies for living systems as they gain internal complexity. If developmental values exist, we humans must be funneling gently toward one ideal set of values most adaptive for high-complexity environments, types that are far more morally restrained, predictable in new ways, and less impulsive than most of us are today. Some of the more creativity– and freedom-driven among us are particularly resistant to developmental thinking. For these individuals, understanding development in all its forms, including universal development, will particularly improve their foresight proficiency. For examples of developmental values progression across cultures and centuries, I recommend Norbert Elias’s classic, The Civilizing Process (2000), and Stephen Pinker’s masterful The Better Angels of Our Nature (2012). Evidence is today scant for the claims I have just made, but as our psychology research and human simulation capacity improves, I strongly expect progressive, constraining, developmental Spiral Dynamics-like models will be increasingly validated. We shall see. For a good book that applies spiral dynamics and integral theory to organizational structure and rulesets, championing bottom-up management, read Frederic Laloux’s Reinventing Organizations (2014). Again, a promising research frontier for all developmental values models is their cyclic nature, once values reach (temporary) states of maturity in any adult individual, organization, or culture, and then begin to decline or regress. As Stan Salthe reminds us in Development and Evolution (1993), all complex systems eventually move from maturity into senescence (over-patterning and decline), and their agility and learning ability must at that point be renewed, or they will eventually fail and die. Understanding how old, brittle, low-learning systems renew themselves is thus a key both to seeing the cyclic nature of any learning system, and to helping systems that are in decline. At the individual level, we need better models of psychological development that incorporate natural cycles of decline and renewal in later life. Lawrence Kohlberg’s stages of moral development are perhaps the best-known psychological development model, with Pre-Conventional, Conventional, and Post-Conventional stages. Understanding how stasis or regression can occur at each stage, and ways that decline can be halted and reversed, are key frontiers of research. We have all known colleagues who increasingly viewed society as a doomed, perverse, or crisis-ridden place in their older age, at least for a time. This most famously occurred with perhaps our greatest Twentieth Century futurist, H.G. Wells. The shock of the First World War and his anticipation of WWII contributed to his dark outlook on humanity in his final years, but if you read him carefully, you will see he became increasingly pessimistic and dogmatic as he aged, long before these seminal events. We see it again in the great futurist, science fiction writer, and satirist Stanislaw Lem. His futurological masterwork, Summa Technologiae (1964) written at the age of 43, while his pessimism was in balance with his optimism, introduces coming topics like virtual reality, nanotech, and the technological singularity, and cleverly anticipates some of the social problems we might expect with such advances. Today, some senior foresight professionals mistake a biological process happening in their minds, a natural mild but inexorable process of decline, with the state of the world and its prospects, which I think is doing exactly the opposite, accelerating in its production of new capacities and opportunities (as well as a smaller complement of risks) every year. I think the older we get, the safer and easier it is to see the negative, and to make self-preventing forecasts about risks and failure states, rather than to argue the positive, and to make self-fulfilling and aspirational forecasts about positive goals or visions. The latter is largely a (mentally) younger person’s game. If too much pessimism (or optimism) is an issue for you, neuroscientist Elaine Fox’s Rainy Brain, Sunny Brain (2012) offers several evidence-based procedures to retrain fear and negativity circuits at any age. As mentioned in Chapter 8 (Your Digital Self) the power of mental retraining will grow greatly for all of us when such procedures are integrated into our groupnets and personal AIs in the coming decades. In a related trend, a kind of creeping and practical pessimism, rather than practical optimism, becomes a systemic bias in many mature-stage leadership environments, as Matt Ridley notes in The Rational Optimist (2011), and Diamandis and Kotler argue in Abundance (2012). At the same time, those who see the exponential power of technology, or who have financial incentive, are often guilty of their own systemic biases, becoming indiscriminate boosters of various technologies, rather than critical evaluators of those few technologies that are actually being disruptive. Read Fenn and Raskino’s Mastering the Hype Cycle (2008) for more on that. We ignore these systemic biases, negative or positive, to our own detriment as foresighters, and must strive to uncover them. Fortunately, decreased depression, anxiety, pessimism, dogmatism, criticism, and unwillingness to learn are not inevitable consequences of aging, and their degree of severity varies widely by individual. There are many tools and strategies available now and more coming with the intelligent wearable web that will help us renew our learning abilities in old age, including cognitive-behavioral therapy, exercise, diet changes, education, games, recreation, spiritual activities, getting a pet, getting a job helping others, de-cluttering one’s environment, and many others. We are also on the threshold of medical therapies that will partially (but perhaps never fully) rejuvenate aging brains (see “Can Compounds in Young Blood Fix Aging?,” Technology Review, (May 2014)). We know senescence is partly reversible in human psychology, and mature organizations can also renew in powerful ways, as Beck and Adizes both argue. Our culture will increasingly come to recognize these facts, to our great collective benefit. Even states and cultures can be affected by value, institutional, and legal stagnation and regression. Jonathan Rauch’s Demosclerosis (1995), and Mancur Olsen’s The Rise and Decline of Nations (1984) are two good introductions to that thesis. Typical social rigidities that come in aging states include plutocracy, political polarization, cultural decline, and lack of media truthfulness and relevance. Periodic institutional, legal, and constitutional reform has traditionally been the best renewal remedy in such situations, and “useful crises” may be required to precipitate reforms in polarized and sclerotic states. Most obviously, to my mind at least, as our information technology gains its own intrinsic learning ability, it will help us lower the threshold of productive group action in response to crises. Our technology is itself a learning system with several powerful new capabilities, efficiencies, resiliencies, and other advantages over biological learning systems, as Ray Kurzweil in The Singularity Is Near (2005) and others have argued. For an example of an acceleration-aware story of mental development, derived from integral thinking and stage models, see Carter V. Smith’s Accelerating Evolution of Integral Consciousness, at AcceleratingEvolution.info. Carter proposes that accelerating technology is co-evolving (and I would add, co-developing) with humanity in a way that is necessarily “driving us to a higher morality.” That is a bold statement, and it deserves to be carefully tested and challenged. That is certainly difficult at present, but think of the benefits to humanity if we continually find more support for this proposal. I think Smith and others of his ilk deserve credit for publicly stating their arguments and evidence, even in a world unlikely to accept them at first, and for inviting ongoing critique and feedback. Only through tentative first steps like these will we get closer to a science of accelerating improvement of mind and morality, a science that I believe will necessarily develop, in time.